The harbour is now a tourist attraction with museums, galleries, exhibitions, bars and nightclubs. Former workshops and warehouses have now largely been converted or replaced by cultural venues, such as the Arnolfini art gallery, Watershed media and arts centre, M Shed museum, Antlers Gallery and the We The Curious science exhibition centre, as well as a number of fashionable apartment buildings. The Bristol Harbour Railway, operated by M Shed, runs between the museum and the Create Centre on some weekends and bank holidays. Historic boats are permanently berthed in the harbour. These include Isambard Kingdom Brunel's SS Great Britain, which was the first iron-hulled and propeller-driven ocean liner; and a replica of the Matthew, in which John Cabot sailed to North America in 1497. The historic vessels of M Shed museum, which include the steam tug Mayflower, firefloat Pyronaut and motor tug John King, are periodically operated. Black and white etching showing the towers of St Stephen's Church, St Augustine the Less Church and Bristol Cathedral, published c. 1850. The view shows the historic Harbour with 10 sailing ships and rowing boats before the channel was filled in 1892–1938. By 1867, ships were getting larger and the meanders in the river Avon prevented vessels over 300 ft (91 m) from reaching the harbour. A scheme to install a much larger lock at Avonmouth to make the entire river a floating harbour, and to straighten the sharper bends, was dropped after work began on the much cheaper docks at Avonmouth and Portishead. The present entrance lock was designed by Thomas Howard and opened in July 1873. This has a width of 62 ft (18.9 m) and is the only entrance lock now in use at the City Docks. In 1908, the Royal Edward Dock was built in Avonmouth and in 1972 the large deep water Royal Portbury Dock was constructed on the opposite side of the mouth of the Avon, making the Bristol City Docks in the floating harbour redundant as a freight dock. In 1977 Charles Hill & Sons, the last shipbuilder at the Albion Yard, closed after delivering the 1,541 tonne beer tanker Miranda Guinness. Part of the yard reopened in 1980 when Abels Shipbuilders began operating, who still produce a steady stream of small ferries, survey vessels, tugs and other craft. The Cumberland Basin & Baltic Wharf are used by a variety of small boats by Baltic Wharf Sailing Club and is surrounded by tourist attractions. The old hydraulic pumping station has been converted into a pub and is a Grade II listed building. ^ a b c d Becket, Derrick (1980). Brunel's Britain. Newton Abbott: David & Charles. ISBN 0-7153-7973-9. ^ "Welcome to the Bristol Ferry". Bristol Ferry Boat Company. Retrieved 3 January 2011. ^ "Number Seven Boat Trips – Home Page". numbersevenboattrips.co.uk. Archived from the original on 17 July 2011. Retrieved 3 January 2011. ^ "Bristol Ferry Timetables and Fares". travelwest.info. Retrieved 8 November 2016. ^ "Boat Trips in Bristol's Floating Harbour and on the River Avon". Bristol Packet. Archived from the original on 30 December 2010. Retrieved 3 January 2011. ^ "Bristol Harbour Festival 2011". Bristol Harbour Festival. Retrieved 3 January 2011. ^ "Picturing the Docks". Responses: Andy Foyle. Archived from the original on 22 July 2011. Retrieved 28 January 2007. ^ "Ship-shape and Bristol fashion". The phrase finder. Retrieved 25 August 2006. ^ Wilson, Ian (1996). John Cabot and the Matthew. Tiverton: Redcliffe Press. ISBN 1-900178-20-6. ^ a b c d e Brace, Keith (1996). Portrait of Bristol. London: Robert Hale. ISBN 0-7091-5435-6. 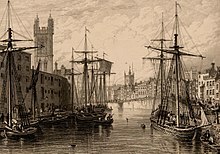 ^ "Bristol harbour history". Tangaroa Bristol. Archived from the original on 18 May 2007. Retrieved 26 May 2007. ^ Pearson, Michael (2003). Kennet & Avon Middle Thames:Pearson's Canal Companion. Rugby: Central Waterways Supplies. ISBN 0-907864-97-X. ^ "Quay walls and bollards". Images of England. Retrieved 18 August 2006. ^ a b c d "The creation of Bristol City docks". Farvis. Archived from the original on 17 May 2006. Retrieved 18 August 2006. ^ "Underfall Boatyard history". Archived from the original on 30 September 2007. Retrieved 18 August 2006. ^ "Chimney of hydraulic engine house". Images of England. Archived from the original on 15 October 2007. Retrieved 18 August 2006. ^ "hydraulic engine house". Images of England. Archived from the original on 22 April 2008. Retrieved 18 August 2006. ^ "former pattern-maker's shop and stores". Images of England. Retrieved 18 August 2006. ^ "Patent slip and quay walls". Images of England. Retrieved 18 August 2006. ^ "A Bond Tobacco Warehouse". Images of England. Retrieved 18 August 2006. ^ "B Bond Tobacco Warehouse". Images of England. Retrieved 8 September 2007. ^ "Robinson's Warehouse". Looking at Buildings. Archived from the original on 27 September 2007. Retrieved 19 May 2007. ^ "The Granary and attached area walls". Images of England. Retrieved 19 May 2007. ^ "Bush House". Images of England. Archived from the original on 12 October 2008. Retrieved 18 August 2006. ^ "BRABY MAKE LIGHT WORK OF MAMMOTH SILO DELIVERY". Braby Ltd. Archived from the original on 3 February 2007. Retrieved 28 January 2007. ^ a b "Development areas in Bristol". Bristol City Council. Archived from the original on 30 September 2007. Retrieved 27 May 2007. ^ a b "Bristol – Harbourside Management". Cullinan. Retrieved 22 March 2015. ^ "New Harbourside development given the green light". BBC News. Retrieved 27 May 2007. ^ "The Pump House Public House". Images of England. Retrieved 18 August 2006. ^ "Eye of The Wind – Newsletter". WebRing Inc. Retrieved 31 July 2007. ^ Staff (1 May 2009). "Bristol harbour reaches 200 years". BBC News. London: BBC. Retrieved 2 July 2011. This page was last edited on 16 January 2019, at 14:17 (UTC).